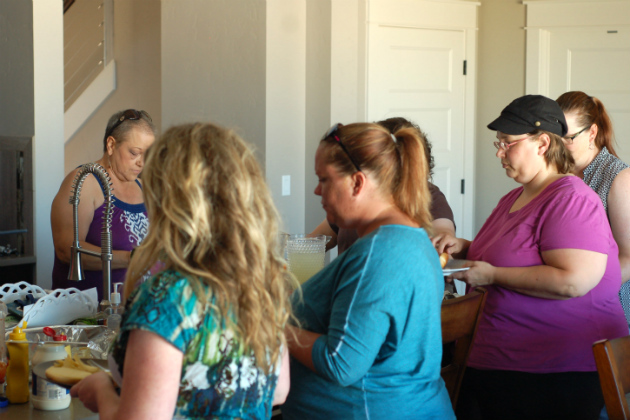 We recently moved into a brand new La Casa Daddio, and my partners at Johnsonville were very kind to provide all of the fixins for our housewarming party. 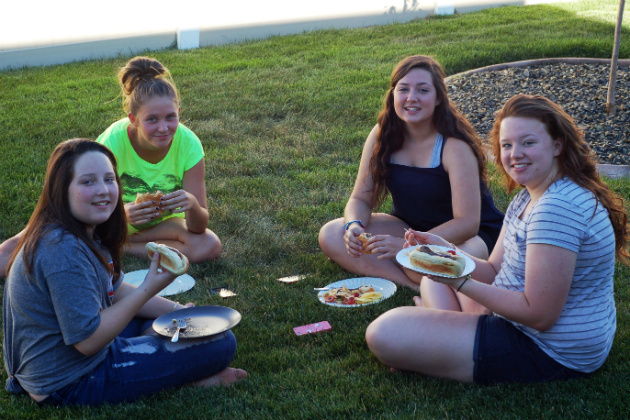 How can you go wrong with good friends and brats from the grill on a hot summer afternoon? 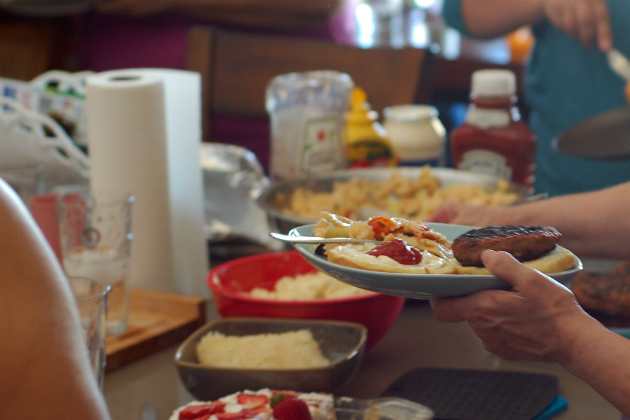 One problem of having a bunch of folks over for brats is that you have to keep them hot and moist as your guests show up. Nobody wants to stand around with that deer-in-the-headlights stare as they wait for you to grill them a brat, and the grill guy (me) doesn't want to deal with that pressure. What's a bratmeister to do? Well, this is where the "brat tub" is your friend. What's a brat tub, you ask? 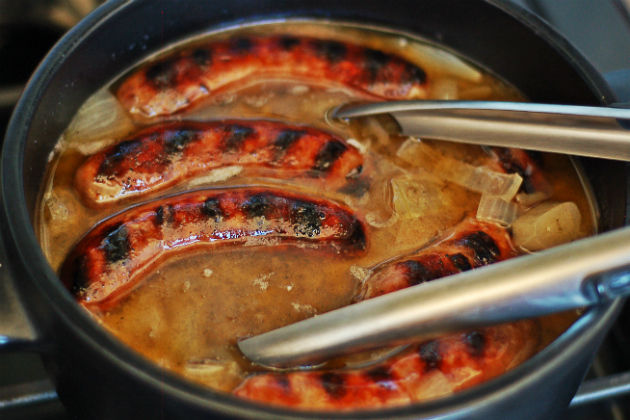 In short, you bring a pan full of beer and onions to a simmer with some butter right on the grill, and you drop your perfectly grilled sausages in the tub to stay hot, juicy, delicious and at the ready whenever your guest is in need of some brat-ness. 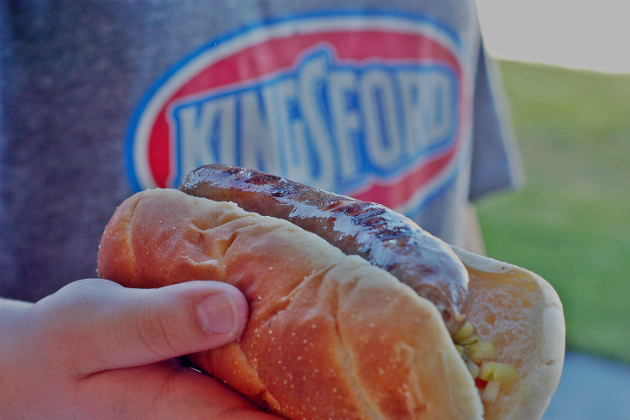 The key to properly grilling a brat is to use medium heat. If you grill them too hot the casings will burst and much of that pork goodness will vaporize on the grill. You want to grill them gently so that they get just enough char. As with any raw pork you want to ensure that you cook them to an internal temperature of 165º. If you're using the brat tub you can cook them to just under finished temperature and let them cruise to a beautiful finish in the beer bath. 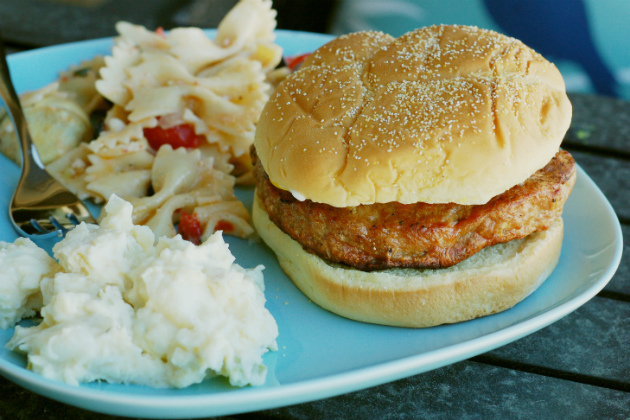 One of the relatively new products that Johnsonville has introduced are their Grillers brat patties. They give you that same great Johnsonville brat taste in burger form. To make things even better they offer Grillers with some great flavor combinations like mushroom and Swiss, and bacon and cheddar. The party was great fun. There's a reason why "move" is a four-letter word, so it was nice to just chill and hang-out with good friends in our new home. Here are some shots of the festivities. 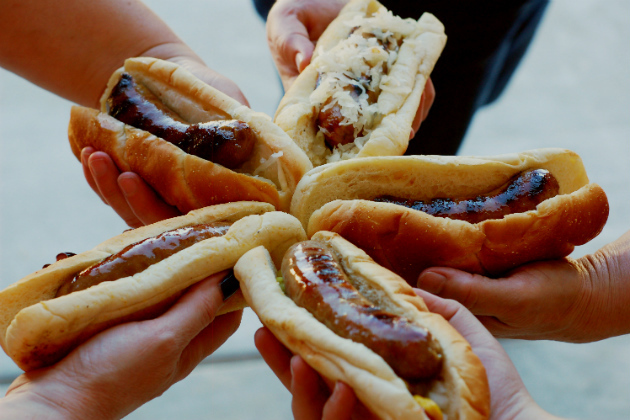 Disclaimer: I am a proud partner of Johnsonville and they provided the food for our party and this post, but the thoughts and feelings expressed here are completely my own. looks like a great party John! I've overcome the bursting and cold inside, burnt outside of sausage and hot dogs by simmering them in hot water on the side burner until needed then finishing them on the grill. If you don't have a side burner then a crock pot will work. Those look to die for! 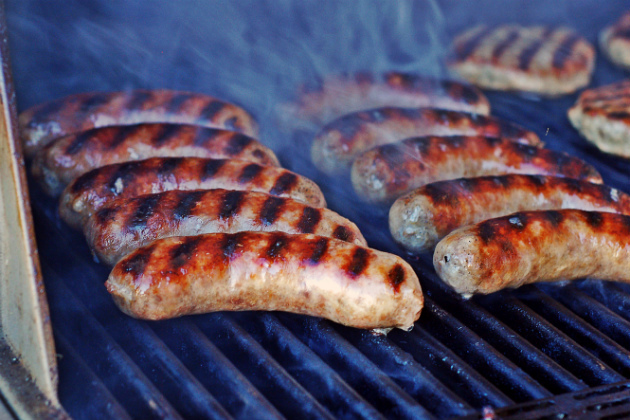 I just wanted to contribute for anyone who might have ended up here looking for advice on grilling brats. I'm born and raised in the heart of brat-country (Milwaukee), so, well, that should speak for itself. If I could give only one tip for brats, it is that everything possible should be done during the entire process to ensure the integrity of the casing. While I was in the military I was invited to a bbq of a coworker who made half of the meats grilled brats just on my behalf. Trying to impress me before the meal, he bragged, yes bragged, about pre-piercing the casings to avoid flare-ups. I pulled him aside to explain the great atrocity he had committed. Never again will I place faith into my brat grilling to anyone outside of the Milwaukee/Chicago area. I like to cook my brats in a brat tub with peppers, garlic, onion, beer and a little butter then as everyone is getting hungry I put them on the grill to brown, then serve. This would be a great idea. Thanks for sharing this cool tip! 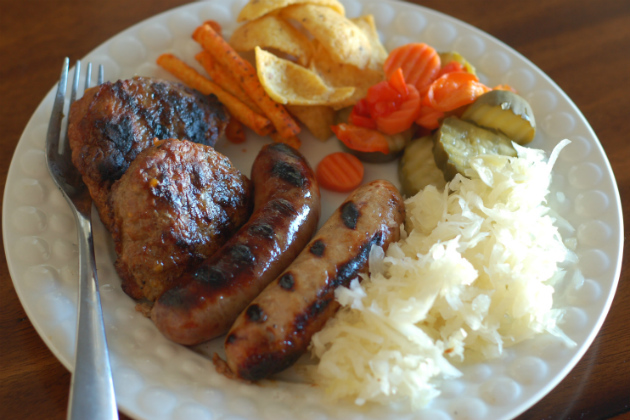 Awesome share, id definitely consider cooking brat myself one of these days.